Those looking to add color to an aquarium need look no further than African cichlids. These are an incredibly diverse group of fish. Each species has its own pattern and coloration, so there is one to suit everybody. This includes the peacock cichlids which are some of the most colorful fish available. These fish are generally harder to look after compared to other popular tropical fish. They are bigger and much more aggressive than tetras, guppies and gouramis. This means that they are best suited to a more experienced fish keeper. Adding these fish to your tank will brighten it up, as well as keeping it looking active and social. 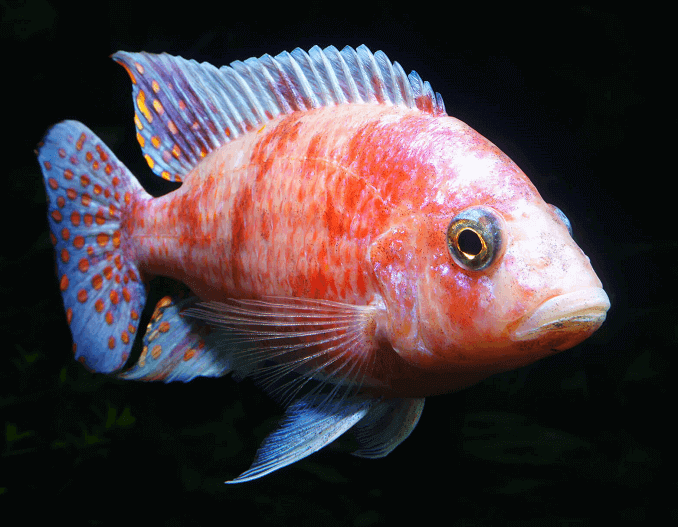 Free Exclusive Bonus: Download the African Cichlid eBook to learn everything there is know about caring for this fish. How Long do African Cichlids Live? How many Cichlids Per Gallon? Are African Cichlids Suitable for your Aquarium (Summary)? African cichlids belong to the Cichlidae family, which includes all other cichlids. Cichlids are one of the most diverse groups of fish and many species can be found in Africa. There could be over 1500 species, but most of these still need to be described by scientists. South America is also home to lots of cichlid species; there are even some that live in Asia. Nearly all African cichlids live in one of three great lakes in East Africa: Lake Malawi, Lake Victoria and Lake Tanganyika. The most popular species for home aquariums are from Lake Malawi. The reason that they are so popular is that they’re some of the most colorful fish available. Each species has its own patterns and colors, so there will always be one that suits you and your tank. Another bonus is that they are quite hardy. This helps them to survive any beginner mistakes, or any situations beyond your control. Their bright colors and social lifestyle makes them an ideal way to liven up a tank. Many fish stores will sell some African cichlid species. You may have to look around a while before you find the rarer and larger species. They are generally more expensive than most other tropical fish. Prices will increase further for the more colorful or larger species. Cheaper species can cost around $5-$15, while some sell for over $100. Healthy adults will be more expensive than juveniles. It depends on the species, but most should live for around 8 years in an aquarium. They are very active fish. Whenever they sense movement outside of the tank, they will follow it in the hope that they are about to be fed. This behavior can make you feel like you’re underfeeding them since they’re always looking for food. Don’t let this trick you into overfeeding them as they would happily keep eating well beyond what they need. Their active lifestyle makes them good swimmers, to the point where they can jump out of the tank; however, they probably won’t do this unless they get spooked or provoked. Another thing to consider is their aggression. They can be territorial at times, especially when mating, which can lead to the death of weaker fish in the tank. To try to reduce fights, make sure that there are plenty of hiding places in your tank. This gives your fish somewhere to escape and also gives them a territory to claim. During the search for food they may dig into the substrate or dig up decorations in the tank. This shouldn’t cause too many problems, as long as anything you place in the tank is well secured in the substrate. Digging isn’t just for scavenging, some species use it as a hunting strategy. Livingston’s cichlid (Nimbochromis livingstonii) burrows slightly into the sediment and plays dead, until an unsuspecting prey passes by. Many of these cichlid species display unique behaviors. The African butterfly cichlid originates from the rivers of Guinea, Liberia and Sierra Leone. An adult will reach up to 3 inches and display five vertical black bars down the length of its body. The bars are complimented by horizontal rows of spots that can be a few different colors, usually blue or green. 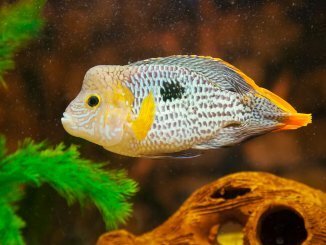 This is one of the most suitable breeds for first time cichlid keepers. It is peaceful, not very demanding, and quite easy to breed. Though it’s not able to produce electricity, this cichlid’s bright yellow color might trick you into thinking so. The fins have black tips which really stand out against the yellow; the dorsal fin starts behind the head and spans the full length of the body. A fully-grown adult will usually reach just over 3 inches. This is another example of one from Lake Malawi. The electric yellow African is a small fish and much less aggressive than other cichlids. This makes it easier to look after and is more accepting of other fish that you add to your tank. 22 species of peacock cichlids have been described, all from Lake Malawi. These fish display a range of bright colors like a peacock’s tail, hence the name. It is the males that display most of the color while the females often look drab in comparison. Sizes usually range from 4 to 6 inches. These fish are ideal for somebody who’s looking for a colorful tank. Some species are more aggressive than others, so research the species you want before buying. This is another example where the name could use a little more imagination, though it is very fitting. A vivid orange covers the body. Sometimes the fins share the same black tips that the electric yellow cichlid has. A rounded head is at the front of a body that can grow to over 5 inches in the aquarium. Unsurprisingly, this is also from Lake Malawi, as most of the brightest colors seem to be. They will be aggressive tankmates, so they should only be kept by experienced fish keepers. They don’t grow too big, but a larger tank will help to reduce aggression. If you are raising them from fry, then you may have to wait a while before they start showing their colors off to their true potential. Sometimes this can take up to a year, but this will vary between species and even between individuals. The brightest colors will come when they are kept healthy. The colors will get brighter during mating and times of aggression or dominance. Males are usually more colorful than females; they need to be attractive to females when mating. Females will either be plainer or have duller coloration/patterns. 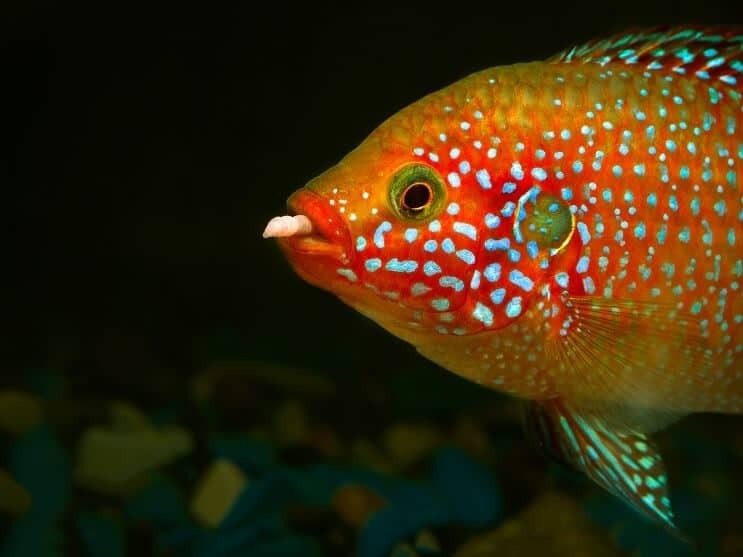 All cichlids have teeth, but each species will have a different set depending on their diet. Some have evolved smaller rows of teeth for scraping off algae from rocks; others have more fang-like teeth for catching small fish. Every 100 days or so they will regenerate their teeth to replace any that have been lost or damaged, scientists are studying this to help with dentistry. Regardless of the species, some will bite you and some won’t; you just have to get to know your particular fish. How Big Do African Cichlids Get? Most will grow between 4-6 inches in length once fully matured. Most African cichlids kept in home aquariums are rock-dwellers. In the wild they’d have little hideaways in the gaps between rocks. You need to know how to setup your tank like this at home. The best way to recreate this in an aquarium is to use rocks too. Make sure they’re placed securely so they don’t collapse (you can buy aquarium-safe glue to stick your rocks together). Since they are known to dig, a fine-grained substrate would be best so that it won’t scratch their scales. The water in the aquarium should be moving, but the filter outlet will be enough to create a small current. Species from rivers might appreciate a water or air pump to create a stronger current. African cichlids need a water temperature of 75-85°F and pH of 7.8-8.6 should keep most species healthy. Africa’s great lakes have quite hard water, 4-6 dH, so try not to use soft water in your tank. Moderate lighting is fine for them. You don’t need any specialist equipment, just a filter and heater strong enough to work in the right sized tank. The filter should process all of the water in the tank 3-5 times in one hour. We don’t recommend an under gravel filter. 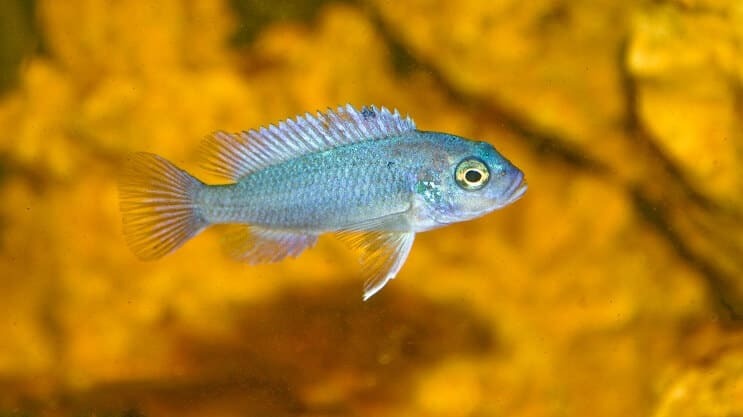 They tend to need a larger grain size on top of them and the digging nature of cichlids means you’ll have to be on the lookout for any exposed areas. Plants often get nibbled in your tank, so they have to be able to withstand it. Java fern, Anubias and Amazon Swords will stand the best chance. 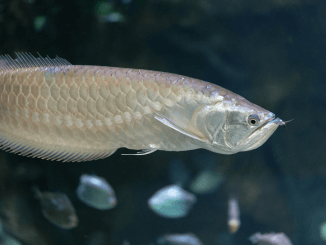 The space your fish need depends on their species, larger ones needing a bigger tank. 30 gallons will be enough for most, but make sure to check what each species needs. The small electric yellow cichlids (3 inches) will be happy in a 30 gallon tank, whereas the larger blue cichlids (8 inches) are better off in a 50 gallon tank. Use this as a guide to judge the best tank size for your species, remembering that a larger tank is always best and will reduce aggression. The amount of cichlids you can keep depends on the species. 30 gallons is enough for a small cichlid, add another 3 gallons per cichlid that you add. Always thoroughly research the species you want to keep, because some are much larger than others. African cichlids are territorial, so any open-water swimmers are likely to be attacked at some point. If you want to mix them with other fish, they need to occupy different regions of the tank so that they don’t enter cichlid territory. Bottom-dwelling fish can make good tank mates, as long as they match the cichlids for size and aggression. Good examples are African catfish, they are fast-swimming, large, and aggressive enough to defend themselves. 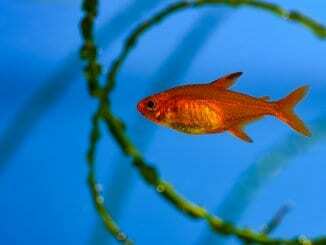 Any small fish (such as tetras) will become a meal. Don’t mix African cichlids with South American cichlids (such as the convict cichlid). They have evolved in different parts of the world so they have different immune systems, this means that species from one region can make the other sick. 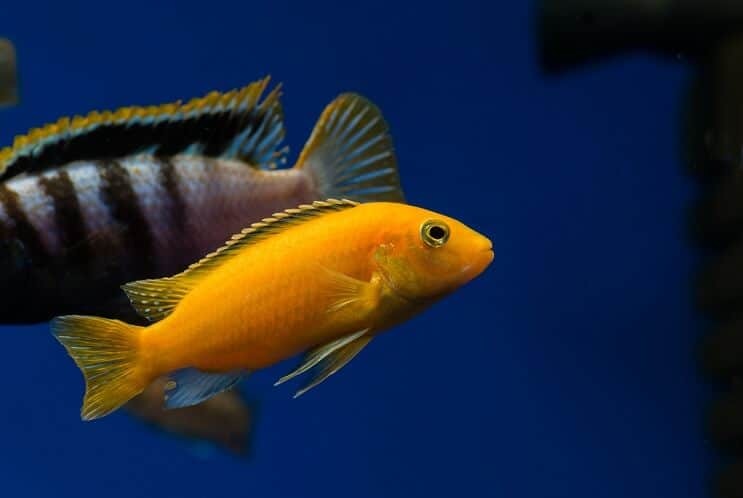 Most of the time, only one species of cichlid is kept per tank to avoid fighting. If a tank is big enough then more species could be added, but this will always be a risk. African cichlids eat different things in the wild such as plants, insects and meat. Most species will happily accept both plants and meats in the aquarium. Peacock cichlids are insectivores, meaning that most of their diet is made up of insects. Some species of the Tilapia genus are herbivores, mainly eating plants and algae. The rest will either eat fish or a mixture of the three diets. The African butterfly would naturally eat small fish, whereas Electric yellow cichlids are more omnivorous, eating plants and the occasional fish. Always research the specific species of fish you want to keep to ensure you can provide them with a suitable diet. Though they have different diets in the wild, in the aquarium they will all be happy eating flake foods bought from stores. You can add in their natural preferences alongside fish foods. These include frozen foods, live foods (fish or insects), or algae wafers. Those species that spend most of their time at the bottom of the tank will enjoy wafer or pellet foods. This will encourage their natural behavior of sifting through the substrate for food. Bloodworms can be used now and then to mix up their diet. Species that are used to a more herbivorous diet will enjoy raw fruit or vegetable matter that you have around the house. Diseases aren’t uncommon when looking after fish. It’s important to know what to look out for in your tank to give yourself the best chances of saving any ill fish. Cotton Wool Disease: White growths caused by a fungus, more likely in poor water conditions. Gill Flukes: A flatworm parasite covers the gills with slime, causing breathing difficulties. Hexamita: Symptoms include a loss of appetite and lesions, causes are thought to be a parasite and poor water quality. Malawi Bloat: Abdomen swelling that can lead to kidney or liver problems. Swim Bladder Disease: Caused by a physical injury or poor nutrition, it leads to difficulty for a fish to stay submerged. Tuberculosis: Can be identified by white blotches and a loss of appetite, it’s highly contagious and often fatal. White Spot (Ich): Caused by a parasite that produces white spots on the victim. Mixing African with South American cichlids can increase the chances of getting a disease because they have evolved different immunities. 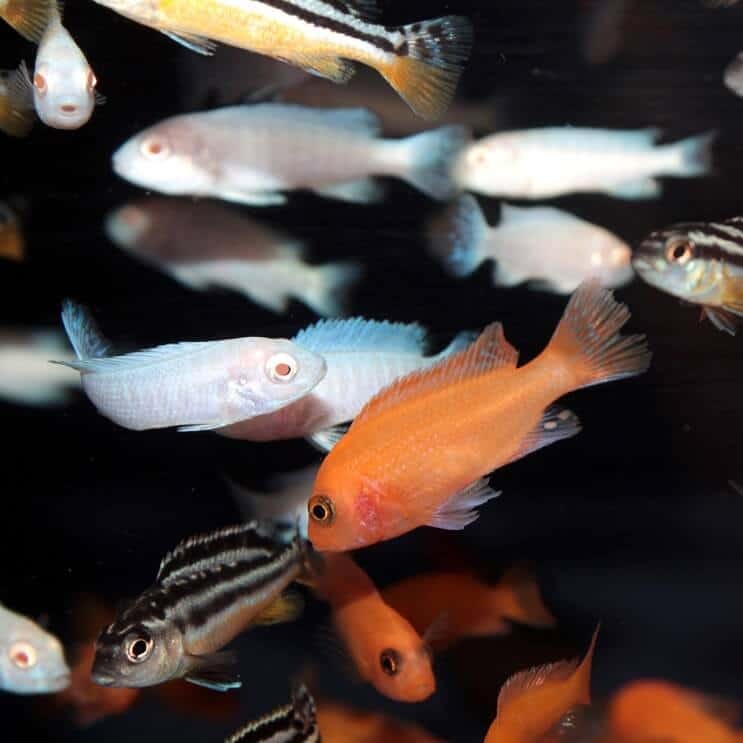 They don’t have any extra special requirements when it comes to their care, just make sure that you clean the tank and do water changes every 1-2 weeks to keep nitrates down. Under the right conditions many species can breed in captivity. All Cichlids lay eggs and most will lay their eggs in the safety of a cave and guard them until they hatch (substrate spawners). Some species are mouthbrooders. This means they hold the fertilized eggs in their mouth until they’re ready to hatch. It takes about 21 days. Once hatched, a female will look after the fry for a week or two, but after that they must fend for themselves and the female is able to breed again. It is hard to say when the young are fully matured because everyone has different experiences. Some may show their fully colors within 3 months and be able to breed within a year, but this will not be the case for everyone. African cichlids have strong parental instincts and usually become much more aggressive during breeding times. These parental instincts can sometimes be lost, they will eat each other’s or even their own fry. To stop this from happening you can separate the parents and the fry using a breeding tank. To attract a mate they usually perform some sort of courting ritual involving specific movements and a display of colors. This can be an impressive sight to watch. To encourage your cichlids to breed, you need to make sure that their environment doesn’t change. This means no aquascaping, no addition of new fish, and no changes to the water parameters. Cichlids are able to cross-breed (hybrid speciation), which is where two different species will mate. This is much more common in captivity because females are surrounded by fewer males of their own species than they would be in the wild. If you’re looking for an addition to a peaceful community aquarium, then African cichlids are not for you. These are aggressive fish that should only be kept with other large, aggressive fish. If you’re looking to start a tank that is full of color and activity then these fish are the perfect candidates. These are some of the most colorful fish in the world and can brighten up any room. An experienced fish keeper shouldn’t have a problem looking after cichlids and will quickly discover why they are some of the most popular fish in the hobby. I began more than 20 years ago with cobalt zebras. I still love keeping the fish from Malawi though I have read and studied all of the others. This time around I began with different varieties of the zebras: orange, blue, blotched; and two melanochromis johanni – about 6-8 fish altogether. The johannni took off — I have about a dozen or more. The zebras I totally expected to breed and they have inter-bred which as an amateur fish keeper intrigues me with the different colors and patterns. Just to add to your excellent advice: begin with the largest aquarium you can afford; use pebbles for substrate (which they still move but not as easily); the best power filter you can get (cichilds are dirty and their size increases the waste); and rocks and Java Fern provide plenty of hiding spaces. With as many fish as I have now, I have to clean the 75 gallon aquarium once a week, but the fish provide a beautiful display of aquatic nature. Great hobby! I have been planning the set up of an aquarium at home (my first aquarium) for some time now and, having considered at lots of different options, I feel I am getting close to making a decision. However, I have quite a few questions. If I could get some advice, it would be really appreciated. Thanks in advance. 1. I am looking at a Flex Roma 125L (33 gallons) 80Wx35Dx50H. Any opinions on this tank/size/brand? 2. PLAN A: I am interested in keeping some cichlids. In particular yellow labs/African cichlids as they seem to be the easiest. And they are really colourful. Any thoughts? 3. How many yellow labs could I sensibly keep in the above tank? PLAN B: Another consideration could be to mix them with electric blue cichlids or cobalt blue zebra cichlids. I understand these are both a little more difficult to keep. Any thoughts? If yes, how would you mix them with the yellow labs? 50:50? Mostly lemon labs and 2/3 blue cichlids? 4. I understand sand and rocks are the most natural habitat for these fish. What’s the thought on plants? Are they necessary? I’m a fan of quite minimalist aquariums, so would probably choose to not put in plants if I could – or put in something small. What about an easily manageable moss? 5. In terms of maintenance, I’m assuming a water change of about 25% every 2 weeks. I assume as they are larger fish, they will make more waste, so I’d need to “hoover” the bottom too. Any advice on this area, would be really helpful.